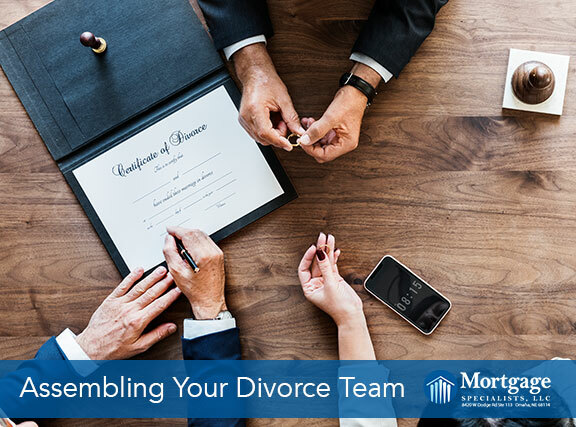 A divorce can be a tumultuous time for a person, which is why it’s more important than ever to assemble a divorce team of experts to ensure you’re taken care of. Some members of this team may include, but are not limited to, your attorney, financial planner, mediator, and lending professional. Did you know that 70% of divorces in the U.S. involve real estate? Having a qualified divorce lending professional on your team can be a huge asset. Think of it like any other mortgage transaction – you wouldn’t refinance a loan with a lender who has never done a refinance. So, why would you choose a lender who has never dealt with divorcing a mortgage? A Certified Divorce Lending Professional brings a wealth of knowledge to the table. They have financial knowledge, expertise, and a full understanding of how divorce and family law, IRS tax rules, and financing strategies relate to real estate and divorce. is aware of specific mortgage guidelines and how they pertain to divorcing clients. is trained to recognize potential legal and tax implications in regards to mortgage financing during divorce. can guide you to avoid potential capital gains concerns in regards to the marital real estate. is able to identify potential concerns with support and/or maintenance structures that may conflict with financing opportunities. can help you implement a strategic divorce settlement agreement, ensuring the best opportunities to secure mortgage financing post-decree. can recommend financing strategies to help divorcing clients identify mortgage financing options for maintaining the current marital home while helping to ensure the ability to achieve future financing for the departing spouse. is qualified to work with divorce professionals in a collaborative setting. remains committed to education and staying up to date on industry guidelines and tax rules as they pertain to divorces. is committed to providing a high level of service to you and your divorcing clients. Brent Rasmussen, President of Mortgage Specialists, is a Certified Divorce Lending Professional. His experience and education in helping clients navigate divorce loans can help make the process as simple and stress-free as possible. Get in touch with us today by calling 402-991-5153.